Expressing one’s love to another is a celebrated custom on Valentine’s Day. Sweethearts and family members present gifts to one another, such as cards, candy, flowers and other symbols of affection. Opinions differ as to who was the original Valentine, but the most popular theory is that he was a clergyman who was executed for secretly marrying couples in ancient Rome. In A.D. 496, Pope Gelasius I declared Feb. 14 as Valentine Day. Esther Howland, a native of Massachusetts, is given credit for selling the first mass-produced valentine cards in the 1840s. The spirit continues today with even young children exchanging valentine’s cards with their fellow classmates. 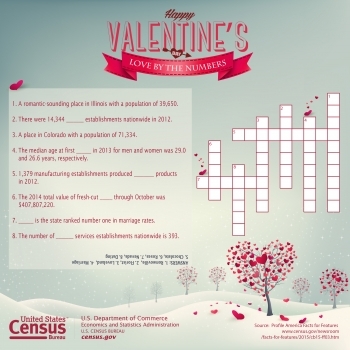 Following are some key statistics released by the U.S. Census Bureau in recognition of Valentine's Day. Number of U.S. manufacturing establishments that produced chocolate products in 2012, employing 37,998 people. California led the nation with 152 of these establishments, followed by New York, with 119. The total number of florist establishments nationwide in 2012. These businesses employed 62,397 people. Among people 15 and older who have been married, the percentage of men and women in 2013 who have been married twice, and 5.3 percent have been married three or more times. By comparison, 75.5 percent of people who have been married have done so just once. Median age at first marriage in 2013 for men and women, respectively. 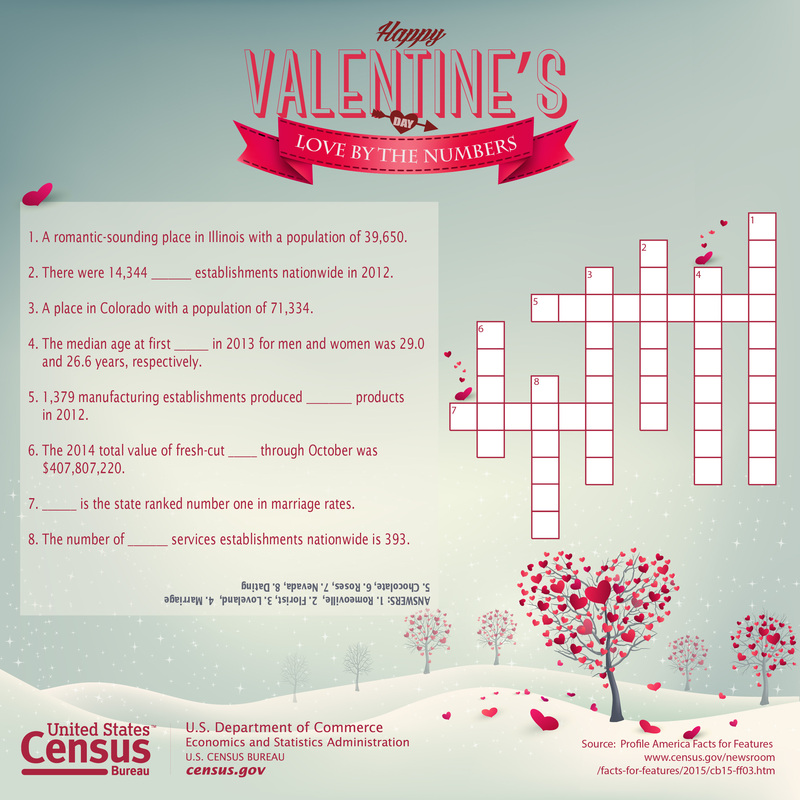 For more more key statistics, please visit the U.S. Census Bureau's Facts for Features.